Leaders need strong court vision. Like a point guard, leaders need to keenly watch, and adjust to the trends and happenings affecting their organization. See the big, and focus on the minute; recognize the minute, and prevent it from becoming the major. The ability to zoom in, or out, has tangible impacts. To understand the impact, we need to recognize that even the best leaders control very little. Organizations are dynamic, and there is no way to have a grasp on every internal activity; outside influences also exist. In “What we mean when we talk about leadership”, Des Dearlove and Stuart Crainer confirm the need for focused leadership. 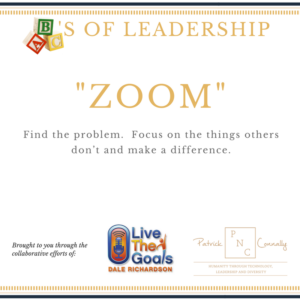 Citing leadership experts Andrew and Nada Kakabadse, their book asserts that a leaders’ ability to zoom on the RIGHT problems, focus areas and situations is a key indicator of their potential success. Driving effectiveness, and sharpening your vision requires an acute knowledge of the people, processes, and values driving your organization. Consider the level of focus and attention given to the challenges you want to solve. Consider the organizational impact, alignment to core values, and level of effort to give to each challenge.